On Wednesday, March 1, 2017, EPI Senior Economic Analyst David Cooper testified before the Baltimore City Council in support of Bill 17-0018 establishing a $15 minimum wage in Baltimore. Members of the council, thank you for holding this hearing and allowing me to testify today. My name is David Cooper. I am the senior economic analyst at the Economic Policy Institute, a non-profit, non-partisan research organization in Washington, D.C., that focuses on improving the economic conditions of low- and moderate-income Americans. I am testifying today in support of Council bill 17-0018, which would establish a minimum wage in the City of Baltimore of $15 per hour. Prior to this hearing, EPI conducted an analysis of who in the city of Baltimore would be affected by establishing a minimum wage of $15 by 2022.i I will briefly describe the topline results of that analysis, discuss the appropriateness of a $15 minimum wage in Baltimore, describe what the economics literature tells us about how establishing a higher city minimum wage will affect the local and regional economy, and then note two areas where this bill could be improved. Establishing a city minimum wage of $11.25 by July 2019 and then gradually raising it to $15 by 2022, would raise the wages of approximately 88,000 workers in Baltimore—a little less than 1 in 4 Baltimore workers (24 percent). This includes 70,000 workers who will be directly affected by the ordinance—meaning their wages would otherwise be below $15—and 18,000 workers who will be indirectly affected by the measure, as their projected wages would likely be just above $15, and they will get a raise as employers adjust overall pay ladders. We estimate that the average affected worker will see her annual income go up by roughly $4,400 in real (inflation-adjusted) terms. The majority are city residents. Roughly 44 percent of the city’s total workforce lives within Baltimore, yet more than 61 percent of the beneficiaries of the proposal live in Baltimore—meaning that city residents will disproportionately benefit from the higher minimum wage. In fact, resident workers are more than twice as likely as commuters to be affected by the proposal: 34 percent of Baltimore resident workers will get a raise, compared with 17 percent of commuters. Is a $15 minimum wage appropriate for Baltimore? First, it is important to recognize that inflation will always reduce the purchasing power of any wage floor over the course of its implementation. Based on the CBO’s forecast for inflation, $15 in 2020 is the equivalent of about $13.06 in today’s dollars.ii For years, EPI has published and regularly updated a feature on our website called the Family Budget Calculator. This tool measures the income a family needs in order to have a modest yet adequate living standard in 618 different geographic areas in the United States. It accounts for differences in costs of housing, food, child care, transportation, health care, taxes, and other necessities. For residents in Baltimore, a one-person budget requires $33,994 to meet the budget threshold. This translates into a full time hourly wage of $16.34 as of this year.iii Workers with children and families would need significantly higher wages. That means that even with a minimum wage of $15 by 2022, some full-time workers will still struggle to make ends meet, although they will be considerably better off than under a $10.10 minimum wage. The second key measure by which economists typically judge the appropriateness of a wage floor is to compare the value of the minimum wage to the wage of the median full-time worker. According to data from the Bureau of Labor Statistics, the median wage of full-time workers in Baltimore as of May 2015 was $21.98 per hour.4 Thus, a minimum wage of $15 in 2022 (or $12.90 in 2015 dollars) would be equal to about 59 percent of the median wage—assuming median wage growth at the rate of overall inflation. This would be slightly less than the relative level of the minimum wage that will be established in California and New York, after both states passed $15 minimum wages earlier last year. However, it is worth noting that both California’s and New York’s increases will have a larger “bite” than the proposed minimum wage for Baltimore. Their increases will affect 37 percent of their respective workforces, whereas this ordinance would affect less than 24 percent of the Baltimore workforce. How would this increase affect employment and the local economy? A city minimum wage of $15 in 2022 would be 48.4 percent higher than the $10.10 Maryland state minimum wage scheduled under current law. Given this difference, it is reasonable to question how this would affect employment and business growth in the city. The effect of increasing the minimum wage on employment is likely the most studied topic in labor economics and the consensus of the profession has shifted dramatically over the past several decades. Early studies of the federal minimum wage in the 1960s and 70s seemed to confirm the rudimentary supply-and-demand model of competitive labor markets, which predicts that an increase in the minimum wage above a “market-clearing rate” will lead to a loss of employment. Up until the early 1990s, there was a consensus in the economics profession that increases in the minimum wage caused job loss. But that consensus began to crack with a new round of research in the 1990s, with many new rigorous studies showing no employment losses and in some cases employment gains due to increases in the minimum wage.iv At the same time, other studies that still found negative employment effects were finding them to be much smaller than was previously thought. By the mid-2000s, the profession was at a place of no consensus on whether the effect of increases in the minimum wage on employment was positive or negative. However, there was a growing consensus that the effect, whether positive or negative, was small. In the last few years, another round of research on the minimum wage—representing the best methodological practices we have—has been peer reviewed and published in top academic journals. These studies find that there has been essentially no effect of increases in the minimum wage on employment, neither positive nor negative. Figure A shows the results of a “meta-study,” a study of studies, of 64 studies on the minimum wage between 1972 and 2007. The X-axis shows the effect on employment resulting from a minimum wage increase; the Y-axis shows the statistical rigor of the study. As you can see, the results of the vast majority of studies cluster around zero, and those studies with the highest statistical power—i.e., the most rigorous studies—all fall on the zero line. Will businesses choose to locate outside the city to avoid paying the higher minimum wage? In all the research on cities that have enacted higher minimum wages, there is no evidence of businesses relocating or adjusting location plans to avoid the higher wage standard. This is because the industries that are typically affected by a higher minimum wages are direct-to-consumer industries: retail, accommodation and food service, education, hospitals, and child care. These are not mobile industries like manufacturing or IT, which might have greater ability to move to areas with lower wages. The primary factor influencing location decisions for businesses in these industries is access to customers. Moreover, the largest component of their operating costs tends to be real estate, not labor costs. If existing businesses have already determined that being inside the city is worth paying higher rents in order to access the city’s consumer base, it is highly unlikely that an increase in their labor costs would motivate them to move – particularly if all their competitors would be facing the same increase in labor costs, and a large portion of the city’s workforce now will have more money to spend. Given that the majority of affected workers from this proposal are city residents, there should be even less concern that businesses would want to move, or would choose to stop locating in Baltimore since the biggest boost in disposable income resulting from this increase will take place among workers living in the city. Will city residents be crowded out of jobs by new commuters from the surrounding area? Establishing a higher wage floor in Baltimore will attract new entrants to city’s labor force, both from within city limits and from outside the city. However, there is little evidence from any other city that has enacted a higher minimum wage that workers from the surrounding jurisdictions have measurably crowded-out local workers. This is because over time, market forces will moderate geographic discontinuities in wage rates for similarly skilled workers within the same labor market. All else being equal, a resident of the surrounding area will only seek a job within the city if the potential increase in her wages exceeds the cost of commuting. As the minimum wage in the city rises, it is possible—at least initially—that there could be a wage premium to commuting into the city. However, if that wage premium were to start drawing substantial numbers of workers away from the city suburbs, businesses in those jurisdictions would have to start raising their wages in order to attract and retain staff. As they do, the pay premium of commuting into the city will shrink, and suburban residents will have less incentive to take on the cost of commuting. Creating a blanket exemption to the minimum wage law for workers under the age of 21—as is currently written in the bill—would undermine key functions of the law and should be strongly reconsidered. There are 29 states, 31 cities, and 9 counties across the country that have established their own prevailing minimum wage and not one of them has a similar exemption – and for good reason. The purpose of establishing a wage floor is to set a standard that applies to the broadest possible range of employers and employees, regardless of the type of work or the qualities of the worker. When that standard is universally applicable, it ensures that all workers are treated equally and that the law is not advantaging certain businesses over others. Any time that you create an exemption or carve out to that standard, you create opportunities for potential abuse. In this case, drawing a line at age 21 creates an incentive for employers to replace any worker who reaches their 21st birthday with someone younger. Although this could encourage some employers to hire younger workers, it will simultaneously discourage them from hiring or retaining workers in their early 20s. Furthermore, such an exemption would advantage entities more accustomed or willing to operate with high turnover – which are typically larger businesses and corporate entities that have well-developed recruitment and training infrastructure. If the goal of this exemption is to encourage employers to consider hiring young workers, there are far less problematic alternatives. For example, the federal minimum wage allow for employers to pay training wages (typically some percentage of the regular minimum wage) to young workers during their initial period of employment. Under federal law, employers may pay workers under the age of 18 a training wage of 85 percent of the regular minimum wage during their first 180 days of employment. This temporary reduction in the wage requirement allows businesses to hire a young worker and either train them or verify that they have the requisite skills for the job before being held to the full minimum wage requirements. A training wage of this structure – some fixed percentage of the regular minimum wage for a limited duration – would be far optimal to establishing a complete exemption to the law based on arbitrary choice of age. There is no reason to think that workers’ skills suddenly change upon reaching their 21st birthday. Thus, it is not obvious why this age—versus any other—should demarcate when workers should receive the full protection of the law. There are undoubtedly workers in Baltimore ages 18, 19, and 20 who have families, children, or parents whom they support. If the goal of this law is to improve the welfare of Baltimore’s workforce, it would be counterproductive to exempt younger workers, who are often the most vulnerable and face the greatest need. Finally, I’d like to discuss the importance of raising the city’s tipped minimum wage and eliminating the differential treatment of the tipped workforce—a step that nine states and one city have already taken. In conclusion, raising the Baltimore minimum wage to $15 by 2022 would meaningfully boost the pay of nearly a quarter of the city’s workforce. The best research we have suggests that any effect of this proposal on overall employment levels is likely to be negligible and several cities that enacted similar minimum-wage standards subsequently actually outperformed the rest of their state in employment growth. Workers in Baltimore, like those in many cities across the country, are in desperate need of higher wages to meet rising costs of living. Raising the city’s minimum wage to $15 by 2022 is a reasonable means and appropriate target for achieving that goal. However, for this bill to achieve its intended purpose, it should be amended so that it does not exempt workers under the age of 21. The council should also consider raising—and ideally eliminating—the lower minimum wage for tipped workers. With these changes, this bill would go a long way towards ensuring that the Baltimore economy works for all its workers. ii. Based on the Congressional Budget Office’s forecast for the CPI-U. Congressional Budget Office. 2017. The Budget and Economic Outlook: 2017 to 2027.
iii. Gould, Elise, Tanyell Cooke, and Will Kimball. 2015. “Family Budget Calculator.” Economic Policy Institute. vi. See Allegretto, Dube, and Reich. 2011. “Do Minimum Wages Really Reduce Teen Employment? Accounting for Heterogeneity and Selectivity in State Panel Data.” Industrial Relations. Vol. 50, No. 2. University of California. vii. Potter, Nicholas. 2006. Measuring the Employment Impacts of the Living Wage Ordinance in Santa Fe, New Mexico. University of New Mexico Bureau of Business and Economic Research. viii. Schmitt, John, and David Rosnick. 2011. The Wage and Employment Impact of Minimum-Wage Laws in Three Cities. Center for Economic and Policy Research. ix. See Lynn, M., M. Sturman, C. Ganley, E. Adams, M. Douglas, and J. McNeil. 2008. “Consumer Racial Discrimination in Tipping: A Replication and Extension.” Journal of Applied Social Psychology, 38: 1045–1060. x. Cooper, David. 2017. “Valentine’s Day is better on the west coast (at least for restaurant servers).” Working Economics Blog. Economic Policy Institute. xi. Calculations using the Quarterly Census of Employment and Wages between 2011 and 2014 (the last available data year for full-service restaurants). For greater detail, see Gould, Elise. 2016. “D.C.’s Fair Shot Minimum Wage Amendment Act of 2016.” Testimony Before the Council of the District of Columbia Committee on Business, Consumer, and Regulatory Affairs. May 26.
xii. Allegretto, Sylvia, and Carl Nadler. 2015. 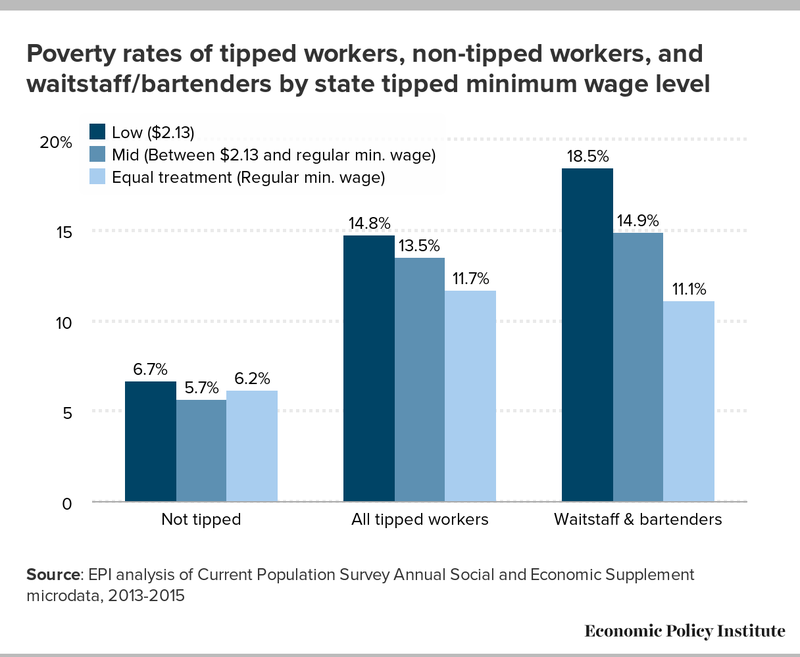 “Tipped Wage Effects on Earnings and Employment in Full-Service Restaurants.” Industrial Relations, vol. 54, no. 4, 622–647.